Sign up for Broadjam today to follow The Blake Music Group, and be notified when they upload new stuff or update their news! Add to Calendar 20-04-2019 22:00:00 20-04-2019 22:00:00 11 The Blake Music Group's Event Alan and Lita Blake trio perform smooth jazz and r&b hits! 1140 Mt. Zion Rd. 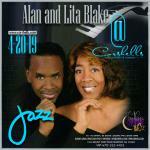 Alan and Lita Blake trio perform smooth jazz and r&b hits!